Labor Day already? It’s hard to believe summer’s over. Most of us will go back to school or back to work. But hopefully, everyone gets a last hurrah in the form of a Labor Day barbecue. If you’re like me, after a summer of cookouts, you’re ready for a party that’s anything but labor-intensive. A feast that’s big on flavor, but light on actual work. 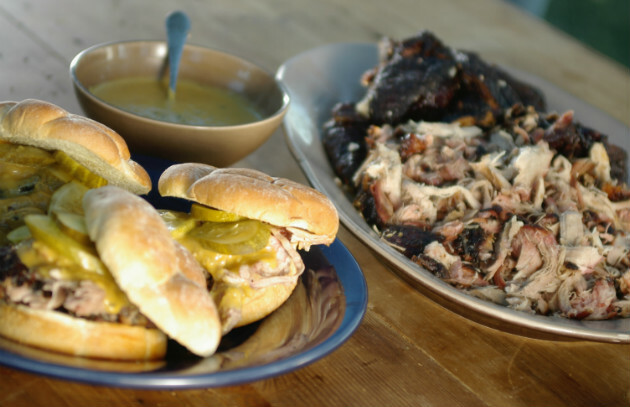 I have the answer and it’s an icon of American barbecue: pulled pork—specifically, the South Carolina version, which features a mustard rub, mustard slaw, and mustard barbecue sauce. Serve it on grilled sesame seed buns with smoked salsa and chips to start with and drunken watermelon for dessert. Yes, it’s easy—you can prepare the whole meal on kettle grill. You’re looking at maybe 45 minutes of prep time, but it will look and taste as though you’ve been cooking all day. In a sense, both are true. All you need to do is to remember to add charcoal and wood chips every hour. Oh, and supply plenty of beer.